previous post: Make Taxi Rides Fun Again! So, is she not the wife of a Bears’ linesman then? yesitsmeaging – Yeah, she is and he’s the husband of a 3 time Olympian champion who recently won a bronze. Doubt you would see a story about him though with that subject title. Poor article jolem and now my webcam keeps turning off and on at random times. Yeah..she’s so pretty..she just HAS to be somebody’s wife..not an Olympic bronze medal champion..
She actually is pretty hot. 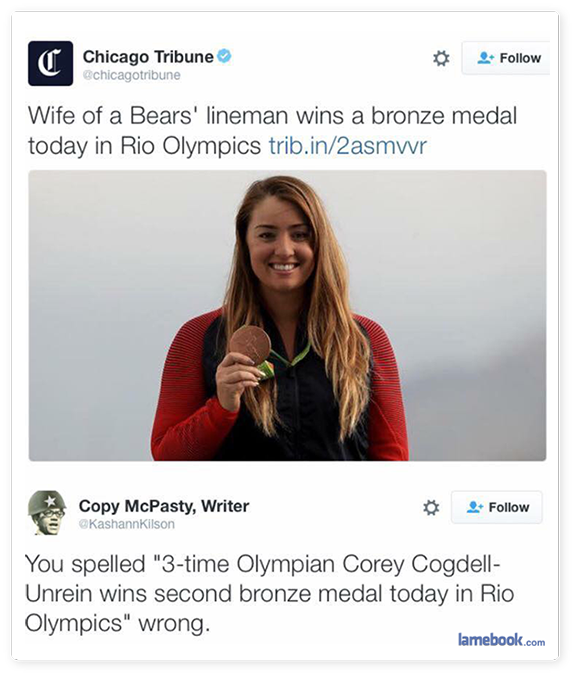 Perhaps the target audience of the Chicago Tribune largely consists of misogynistic football fans. In that case, well done.